i b i k e l o n d o n: As the LTDA goes to war with cyclists, we ask just who runs London? 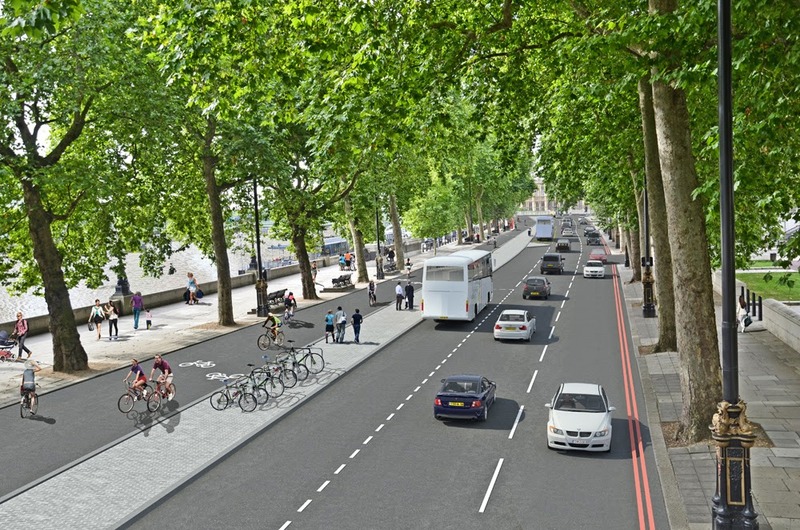 Is this a Cycle Superhighway stitch up?! 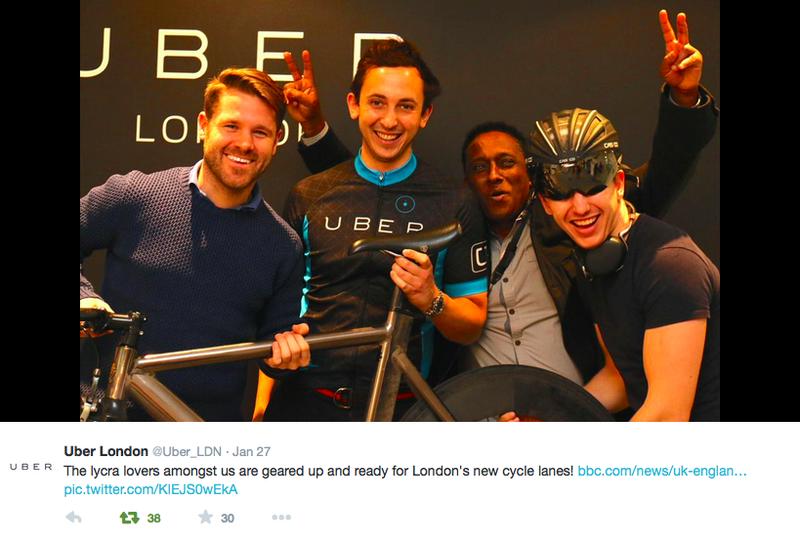 As the LTDA goes to war with cyclists, we ask just who runs London? Is this a Cycle Superhighway stitch up?! Unless you've been living under a rock it won't have escaped your attention that Mayor of London Boris Johnson announced on Tuesday his intention to proceed with ambitious plans to build a "Crossrail for Bikes"; two new segregated Cycle Superhighways across central London, running from north to south and east to west. But those plans are seriously threatened due to the self-serving actions of two business groups, who could jeapordise the democratic balance of Transport for London's Board in the process. Johnson's announcement follows one of Transport for London's largest ever consultations on a project, with a staggering 21,500 responses. So many people wanted to respond, they extended the length of the consultation to allow everyone time to air their views. 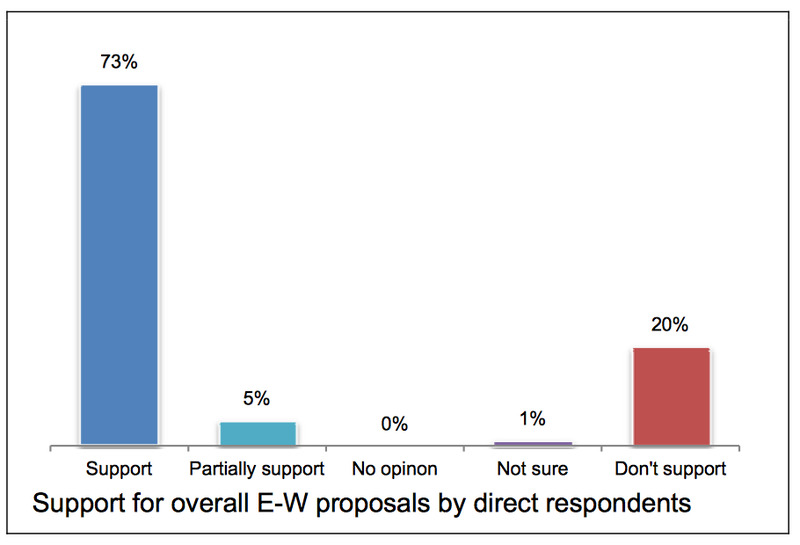 But the results are conclusive; even when you discount responses automatically generated by the London Cycling Campaign's website, some 73% support the more contentious east / west route running along the Embankment. This reflects a recent YouGov poll of Londoners of all backgrounds, the majority (64%) of which supported the cycleway plans even if it involved taking a lane away from traffic. It's also worth remembering of course that the consultation is not a referendum on the proposals; the scheme is the brain-child of our directly elected Conservative Mayor, who is mandated by the population of London to deliver his manifesto promises, of which the Cycle Superhighways were one. So far, so democratic, right? "It’s an abomination!... ...The ideal route would have been to run it along the Southbank, in front of the old LWT [London Weekend Television] building all the way along there, it would have been lovely, it would have been out of the way, it would have been ideal... ... We’re against it, lots of businesses are against it. We are considering a Judicial Review against the scheme in conjunction with Canary Wharf and others." I think it is fair to say that the LTDA has gone to war against cyclists. In November 2013 - the same month six London cyclists died on our roads in just two weeks - they gave the Evening Standard cooked up footage which claimed to show the majority of London cyclists run red lights. The idea that the LTDA is a paragon of working class, salt-of-the-earth virtue is preposterous: this is an organisation that gives discounts to its members for country hotel leisure breaks, golf clubs and designer glasses. (And cheap legal representation to those facing driving bans who accumulated too many points on their license) Most of their members will be earning around £60,000 a year (that's twice the national average). Let's contrast that with the 13 people who were killed cycling in London last year: two teachers, two students, a ventilation engineer, a conference organiser, a pharmacist, a hospital porter, a bus depot worker, a solicitor, an IT worker, one person unknown and a security guard. Hardly what I'd call a "metropolitan elite". And were those who were killed cycling "a few hundred yards or half a mile to work"? Of course not. The majority of all cycle journeys in London originate in the fringes of zone 2 and 3 and make their way to the centre and back again. Commuting patterns like my own journey to and from work which is 10 miles, versus the city-wide average of 15 miles (That's 15 miles regardless of which mode of transport you use). Taxis ferry about businessmen on expense accounts and unwitting tourists for the majority of the time, and are out of reach for most ordinary working Londoners. The last time I took a taxi from Heathrow to central London it cost nearly £100 (an awful journey during which the driver stopped his car to scream obscenities at a woman on a pedestrian crossing and deigned to share with me his abhorrently racist views for the duration of the trip). The Piccadilly Line can do the same journey - opinion free - for about a fiver. As for sticking the Cycle Superhighway south of the river (presumably because Black Cab drivers don't go there) frankly, why should they? For a starter the whole point of the project is to get people by bicycle to centres of work quickly and safely. London's bridges are already a danger spots for cyclists, but to put it in language the LTDA would understand: around half of all the vehicles on Blackfriars Bridge during the peak hour are bicycles (that's one bike every two seconds) Are you sure putting more bikes on the bridges to get south of the river is such a good idea? 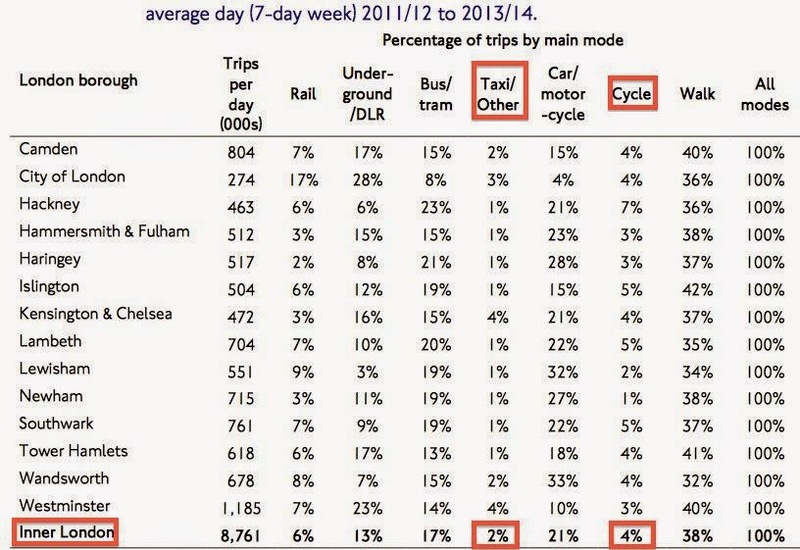 To put things in a clearer light, and to completely discredit McNamara's idea that cycle journeys are somehow unnecessary and get in the way of "working London", let's look at some actual statistics. Via As Easy As Riding A Bike, with thanks. According to Transport for London's latest data, taxis make up 2% of all inner London road users. Bicycles make up 4%. Cycle rates in the same area have doubled over the past 10 years, whilst journeys by car have consistently declined. Across greater London there are approximately 650,000 cycle journeys every day - they can't all be Bradley Wiggins wannabes making laps of Richmond Park. The LTDA's stance is astonishing. That they'd channel so much effort and resource in to giving such a knee-jerk and provocative reaction to a scheme that will cover a tiny percentage of London's roads (whilst their members lose massive market share to credit-card accepting mini-cab firms and book-by-app discount drivers Uber) is sad to watch. If I was an LTDA member I'd be telling them to pick their battles. As a cyclist I'd laugh if this wasn't so serious. A Judicial Review could see the Cycle Superhighway project delayed by up to 14 weeks, and it's TfL's fare-paying customers who will pick up the bill for fighting it (you know, ordinary working Londoners). But the madness doesn't stop there. The LTDA's McNamara said they "are considering a Judicial Review against the scheme in conjunction with Canary Wharf." You'll remember that the Canary Wharf Group were behind an anonymous briefing filled with untruths about the Cycle Superhighways which was distributed to politicians and business leaders late last year. They've also paid for a lobbyist to tour the political party conferences to try and drum up opposition to the scheme. Their strategic adviser, Howard Dawber, has appeared on television and radio claiming the project would be bad for their business and has attended numerous stake holder planning meetings. And this is where things get ridiculous. If a Judicial Review doesn't materialise, next Wednesday the Board of Transport for London will meet to decide whether to fund the Cycle Superhighway project or not. This is not just a case of rubber-stamping the Mayor's plans. As Cyclists In The City points out, they've picked over cycling plans in minute detail before. 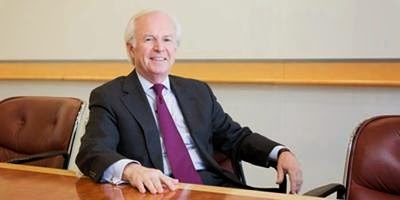 Peter Anderson sits on the Board, and is also the Finance Director for.. ..Canary Wharf Group. Bob Oddy sits on the Board, and is also the Deputy General Secretary of... ..the LTDA! The LTDA's Bob Oddy, above, and Canary Wharf Group's Peter Anderson, below. In the long term I would ask - considering there's more of us on the roads every day than there are of them - why taxi drivers are represented on TfL's Board when cyclists are not. In the short term I'd ask this: what will the Mayor do to ensure that those whose employers have been actively lobbying against this scheme are totally excluded from the process which will decide its future? London's cycling community has fought long and hard and waited for many years for this: just ONE safe segregated cycle route across our city. This project cannot be scuppered by members of the Board who no longer have a right to be involved in it. If Anderson and Oddy think they can turn up at the Board after all their companies have done they've got another thing coming. Transport for London's Board meeting takes place at 10AM on Wednesday 4th Feb at City Hall, committee room 4. It is open to the public and the Board papers are available online to review. 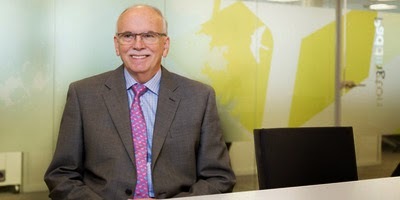 There are actually 2 taxi reps on the TfL board - Steve Wright is the chair of the Licensed Private Hire Car Association. I haven't read the consultation responses but I'd be surprised if the private hire people were in favour of the scheme but maybe they are keeping quiet allowing the black cabs to shoot their mouths off in public. Two reps from the taxi industry on the TfL board means it is ridiculously overrepresented although given the 2 groups are in competition (private hire benefit from Uber, black cabs hate it...) TfL may feel they can't have one without the other so the obvious solution is to have neither of them. The black cabs complaining about a metropolitan elite is somewhat ironic given the rich elite are their main customers and they would be out of business without them. "The N-S and E-W superhighways are of course important spines, but I would be the first to accept that they are not making a dense network. "What they (hopefully!) will do is deal with the majority of capacity and technical layout issues in one big hit which will lead to people realising that if it can be done on those streets, it would be a doddle elsewhere." "Piece by piece, London is going to turn into a city where most people can use a bike." "London's cycling community has fought long and hard and waited for many years for this: just ONE safe segregated cycle route across our city." "In the long term I would ask - considering there's more of us on the roads every day than there are of them - why taxi drivers are represented on TfL's Board when cyclists are not." The usual "us" and "them" attitude is a loser's argument. What you should be arguing for is for appropriate representation on TfL Board of experts in active travel, an activity that ALL LONDONERS need to engage in, and represent 42% of all trips in Inner London. Thanks Andrea, I agree that "us" and "them" won't really get us anywhere, but sometimes you have to fight fire with fire! I totally agree that there should be experts on the board about transport and active travel - most especially to represent journeys conducted by foot. In the same breath, I'd argue that cyclist's needs are quite specific and there should be a cycle rep up there too. Regarding that cycle rep - I'd nominate Chris Boardman. How do we go about it? Meantime, has anyone heard from Andrew Gilligan recently? 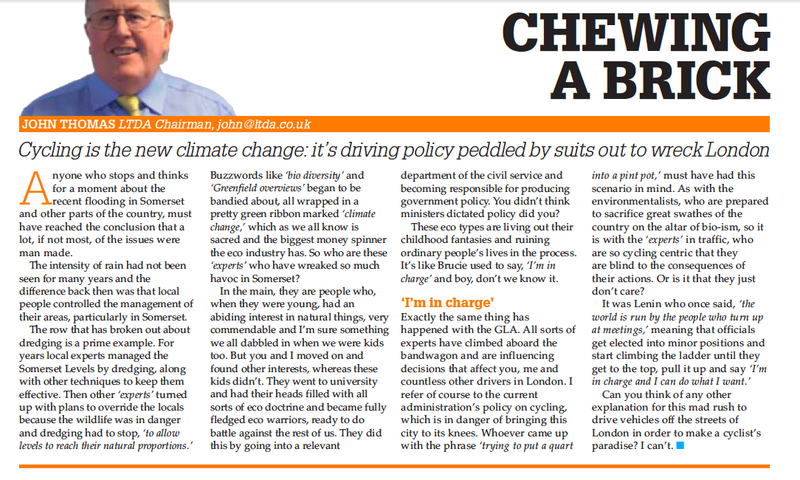 I would suggest Ashok from London Cycling Campaign, rather than Chris Boardman who has admitted to not cycling in London. The headline about cycling being "the new climate change" is pretty telling. These guys are totally out of touch with reality - cycling is, like climate change, happening whether they like it or not - and out of touch with popular opinion - a big majority in the UK accepts the reality of climate change. The worrying thing is that just as big money can help protect vested interests from action on climate change, so it can prevent investment in proper cycling infrastructure. Cycle rep - I'd nominate Donnachadh McCarthy. He's intelligent, articulate, has a lot of experience of politics, and is great at arguing the side of the pedestrian and bicycle user. @Danny Yee I think you're right; those who are against these plans were hoping the consultation would be a choice as to whether these plans would go ahead or not, which is why I think they've had the wrong end of the stick from the start. I guess that change is a hard thing for people to deal with. Regarding suggestions for a cycle rep on the TfL board it would be great to have someone with a proven track record of delivering programmes, channeling cycle funding, and who is articulate. I agree that Ashok from London Cycling Campaign is a great suggestion. Whether we'll see it ever happen is another thing entirely of course! Why do we have unelected people making such decisions in the first place? Perhaps it needs to be replaced with GLA members? I'd love to know if cyclists use cabs more or less than most other commuting folk. Based on my own experience I didn't have a car for a number of years, but cycled, used cabs and zipcar depending on which was most appropriate. Aside from saving me a small fortune, it meant I used a car a lot less and taxis a lot more as I could afford the luxury when I really wanted it. If the wider group of cyclists were similar, I'd suggest a public boycott of black cabs until the LTDA change their position. Hit them in the pocket, where it hurts. Steve McNamara spouts the usual nonsense that London is a 'working city', as if that automatically disqualified it from having safe infrastructure that everyone could potentially use and everyone could most certainly afford (as opposed to rocketing taxi fares). He rather myopically ignores the fact that other cities that have successfully introduced protected bike lanes - across the Netherlands, Copenhagen and New York - are not exactly idyllic rural backwaters. JimF said... "If the wider group of cyclists were similar, I'd suggest a public boycott of black cabs until the LTDA change their position. Hit them in the pocket, where it hurts." The LTDA represent only about 6000 of the 24,000 registered black cab drivers. The chances of you actually smiting the LTDA by not taking a cab is low. Here's something about Steve McNamara: Examine his language. Deconstruct it and understand the mindset he comes from: he never refers to women as either drivers or cyclists. I'm very worried about the plans to encourage yet more cyclists in London because I am a pedestrian doing a 45 minute walk through the West End twice a day. There are just too many bad cyclists on London's streets. The worst problem for pedestrians is cyclists RLJ'g. It's an inconvenience (at best) and danger (at worst). It's done by a minority of cyclists but a substantial minority, sufficient to make crossing the road when it's supposed to be safe to do so (i.e the green man is on) a difficult undertaking - you need to keep your wits about you in case one shoots over at great speed. Cyclists need good training not just how to keep themselves safe but also in how to prevent themselves being a danger to others. They also need a culture change in the MAMIL machismo one unfortunately sees so often. Until these things happen, there should be no question of extending the numbers of cyclists in central London. Go and watch the streets and look at how many pedestrians do exactly the things you describe. Whats wrong with the UK's isnt as simple as "cyclists need more training" but that EVERYONE needs road craft training from an early age. Our roads need taming so that people do not think that the size of the vehicle you drive (and how much pollution it spews out) gives your priority and power over others. Our traffic laws need tightening and (most of all) implementing because the police sit on their hands with traffic violators, the CPS pass on cases citing lack of evidence where theres a clear case of dangerous driving, and the courts that pass joke sentences, allowing dangerous drivers to retain their licenses when they should be permanently revoked. Go back out on the London streets, open your eyes properly and you'll see that pedestrians greatest danger is themselves, not cyclists. Thank you for giving us this information. It is important that we all share this content.